GM tested a self-driving Chevy Bolt in San Francisco on Tuesday. 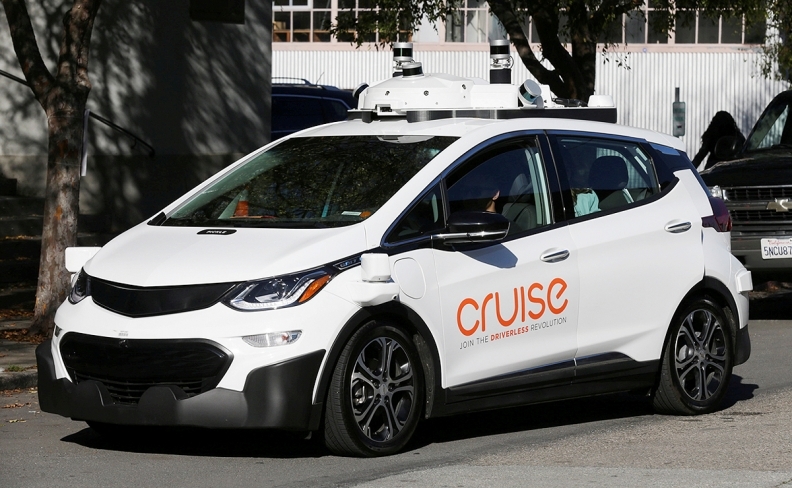 General Motors plans to launch commercial autonomous vehicles at scale within two years as it reduces the costs of self-driving technologies and moves into service-based operations such as ride sharing. The automaker expects to deploy the fleets in “dense urban areas” by 2019, GM President Dan Ammann said during an investor event Thursday in San Francisco. Revenue from the fleets, he said, is forecast to be in the billions soon after launch. Ammann’s comments and others during the presentation were the first public confirmations that GM plans to enter ride-sharing against the likes of Uber and Lyft, which the automaker invested $500 million in last year and Ammann holds a board seat. GM did not specify where the fleets will launch. The company is currently testing a third-generation of self-driving vehicles based on the Chevrolet Bolt in San Francisco; Scottsdale, Ariz.; and Warren, Mich. It has plans to begin testing in New York City next year. Ammann said GM expects the cost-per-mile of its autonomous ride-sharing vehicles to fall under $1 by 2025 -- a key, he said, to achieving profitable scale. The current cost in a city such as San Francisco, according to Ammann, is $2.50. Ammann said the lifetime revenue generation of one of its self-driving cars could eventually be in the “several hundred thousands of dollars” compared to $30,000 on average that GM collects today, which mostly comes from the initial sale. GM Chief Financial Officer Chuck Stevens said its mobility services could be “potentially bigger” than its current core business, with better margins. Helping GM’s confidence with launching the fleets are advancements in its self-driving technologies and reduction in costs, including a next-generation lidar that will cost about $10,000 -- roughly half of the $20,000 or so the automaker is paying now, according to Kyle Vogt, CEO of GM’s self-driving Cruise Automation unit. GM in October said its acquisition of lidar developer Strobe Inc. would lower the cost of lidar units 99 percent, however it did not provide details of the actual costs at the time. GM said it now expects that cost to be reduced to about $300 in the future. “We’ve basically taken some of the best technology in the market and accelerated its deployment,” Vogt said during his part of the event. GM plans to increase its autonomous vehicle employees to about 2,100 by 2018, up from 1,200 today and less than 100 in 2016. The company, according to Vogt’s presentation, has already recruited high-ranking officials from Uber, Netflix and Google, among others to Cruise. Barra said GM’s so-called plans for “transportation as a service” are meant to complement the automaker’s core business and improve it for what many are referring to as “Automotive (or Auto) 2.0,” a reinvention of the automotive industry led by zero-emission, autonomous vehicles. “We are very well positioned to move forward and create this vision,” said Barra, who earlier this year announced GM’s vision of an autonomous zero-emissions future. Some have speculated that GM’s mobility business could be valued at up to $30 billion if spun-off, however Barra and other executives on Thursday reiterated that their plan is to keep everything in-house. "General Motors is sending the message to investors that it is speeding towards an autonomous electric future that will include ride sharing -- and will be profitable," Autotrader analyst Michelle Krebs said in a statement. "GM claims it intends to be the leader in autonomous vehicles. There is evidence that it is leading with proof points like the autonomous Chevrolet Bolt EV demonstrated in San Francisco this week." The event comes three weeks after Barra better detailed its plans to launch 20 new all-electric and fuel cell vehicles by 2023. It also follows somewhat negative press this week on its self-driving fleet, which was reportedly stopped in its tracks by a taco truck. GM’s shares closed down 1.6 percent to $43.09.